Belfast, Northern Ireland, 23rd February 2012 – Andor Technology plc (Andor), a world leader in scientific imaging and spectroscopy solutions, today announced the launch of their EX2 technology, which delivers extended Quantum Efficiency (QE) performance across selected iXon Ultra and iXon3 back-illuminated EMCCD models. Available on the new speed-boosted iXon Ultra 897 platform, as well as iXon3 897 and 888 models, EX2 technology facilitates broadening of the QE range of the back-illuminated sensors through implementation of a new dual anti-reflection (AR) coating process, developed by sensor manufacturer e2v (Chelmsford, England). This offers significantly improved sensitivity in both the blue and NIR wavelength regions, whilst maintaining ~ 90% QE across the remainder of the visible region. Also available on these models is the addition of Fringe Suppression technology, a further process implementation that reduces the spatial etaloning effects of back-illuminated sensors that can otherwise affect monochromatic imaging in the NIR region. 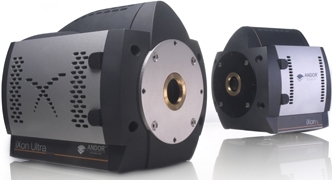 Dr Colin Coates, Imaging Product Manager at Andor Technology, commented; "The sensitivity boost in the blue and NIR regions offered by EX2 technology is applicable to a wide range of low light applications, such as ultra-cold ion imaging, luminescence detection and calcium signalling. The further option of Fringe Suppression technology, which can be ordered with or without EX2, is ideal for achieving higher levels of data integrity in NIR applications such as Bose Einstein Condensation (BEC)."